Pat shrimp dry with paper towel. Season the shrimp with salt and pepper. Heat oil in a frying pan over medium heat and add shrimp to the pan. Once the edge of shrimp turns pink, flip to another side. Sear on both sides until cooked though. Do not overcook. Set them aside. 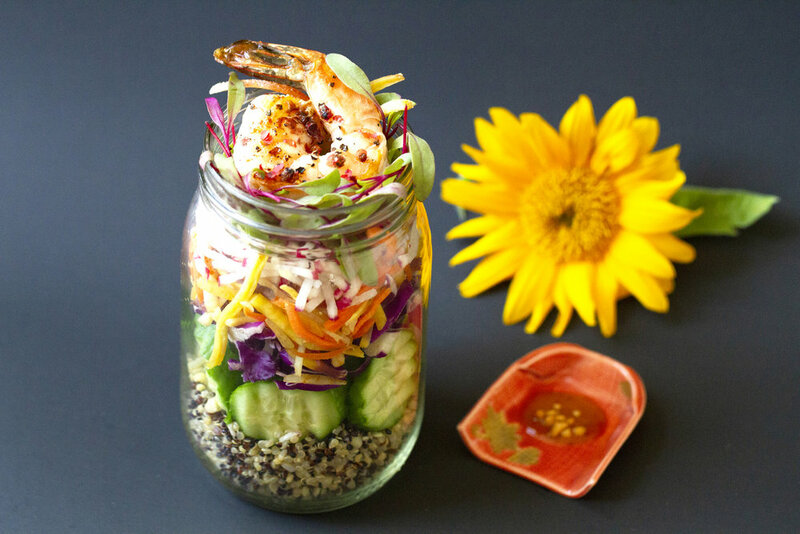 Arrange your mason jar by putting quinoa at the bottom, followed by cucumber, cabbage, carrot, radish, microgreens and seared shrimp. Sprinkle with ground peanuts and put on the lid. Serve with WATCHAREE’S Thai peanut sauce as a salad dressing. You can also add WATCHAREE’S Thai peanut sauce at the bottom of the jar, then put the cucumber and cabbage at the bottom to prevent the quinoa from getting soggy. Add quinoa and the rest of ingredients and seal your jar. Enjoy your grab and go salad!